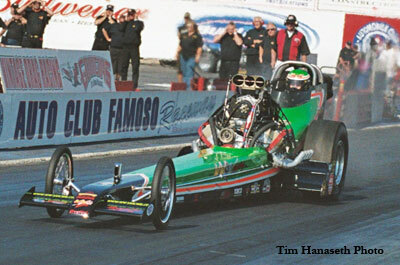 10/30/2005 Bakersfield, CA - The Goodguys 7th Fuel & Gas Finals will probably not be remembered as the "feel good" drag race of the year. 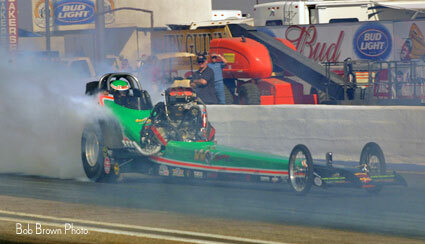 It will more likely be recalled as the "upset nationals" mixed with tragedy and near misses. 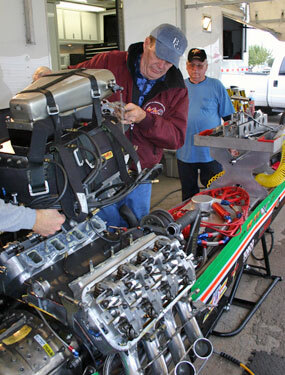 Amid great daytime racing conditions the event was running just slightly behind schedule until about 4 pm on Saturday afternoon when 76 year old Ray Moore sustained fatal injuries during the final session of C/Gas qualifying. 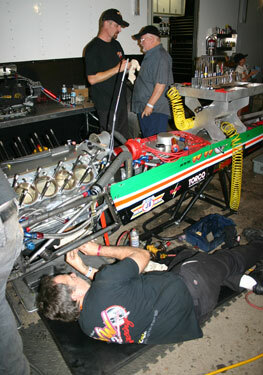 The two and a half hour delay put the remainder of the days schedule into chaos. 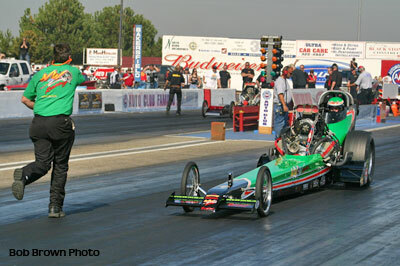 Several Top Fuel teams will say the delay was the major cause of the upsets and off pace times in the first round of eliminations Saturday evening. We'll never know. 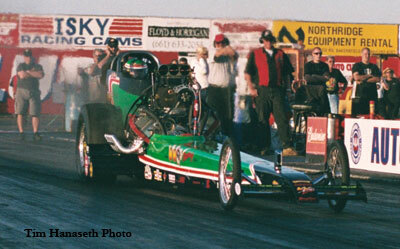 Going into the event there were five drivers within striking distance of the 2005 Top Fuel Points Championship. All five made the show and after first round but only two made it to the second. It was like the championship nobody wanted. 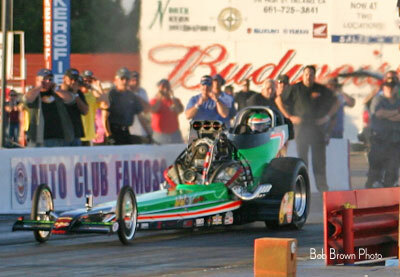 There was no huge surprises in qualifying with Jim Murphy grabbing the # 1 spot with low ET of the event... a sterling 5.85. 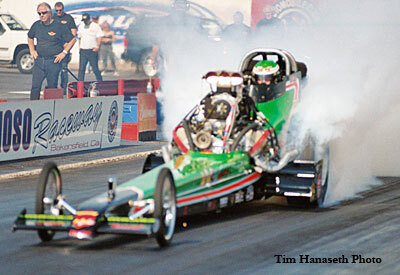 In the end it was the second quickest 16 car field in history and had all the makings of a great show. In round one the points leader, Rick McGee (in on the break rule) smoked the tires against Rick White (who was # 2 in the points) leaving White well in the hunt. 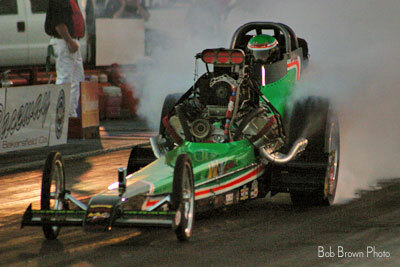 Then Bill Dunlap put Jim Murphy, the # 5 points driver away in a very close race eliminating him from the picture. 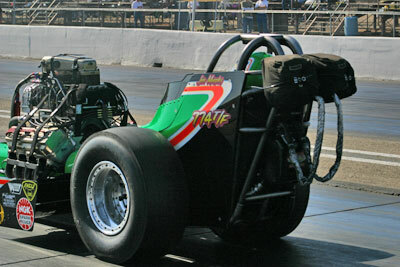 # 4 in points, Terry Cox hung in by beating Mark Hyla running low ET of the round (5.896). 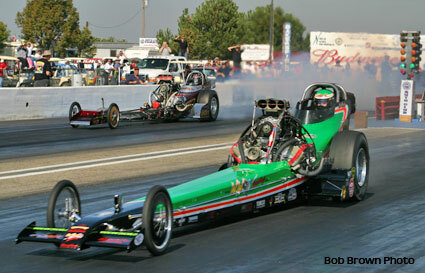 Another shocker followed when Rick Rogers won a pedalfest over the # 3 driver, Brett Harris. No repeat championship for Nitro Thunder. At this point all White had to do was go two more rounds if Cox lost in round two (which he did) for the championship. 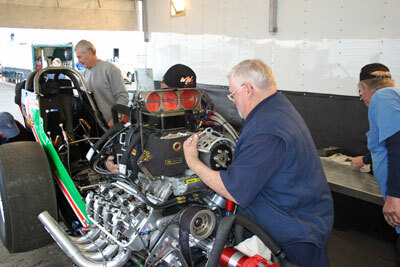 Jim Murphy and Terry Cox were the fifth pair out for the first qualifying session on Friday. 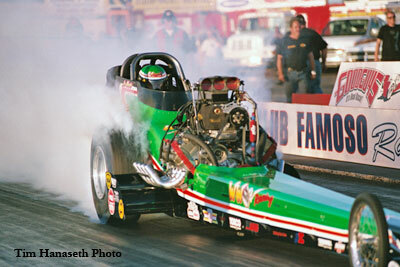 With the mixed bag of times and tire smoke before them it was obvious there was a fine line in the tune up department. 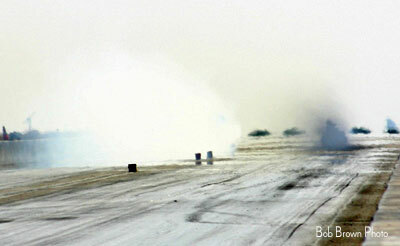 To this point there were only Chevies with good runs - the hemis all smoked the tires to one extent or another. 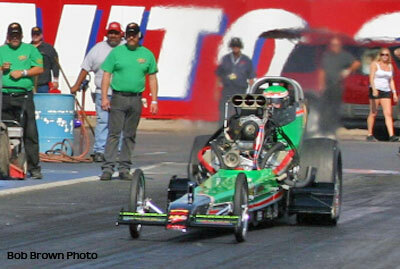 Murphy heats the tires in the left lane. 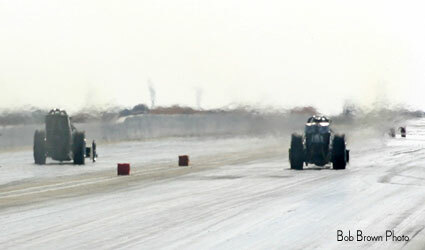 Murphy backs up in his "tracks" from the burnout. 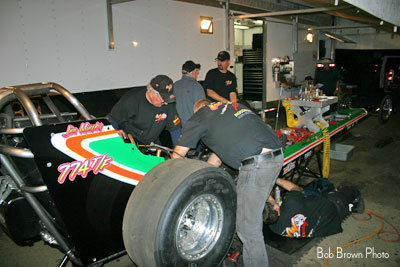 The tires are given an final cleaning before Murphy stages. Murphy has struggled all season and finally called Alan Johnson last week. 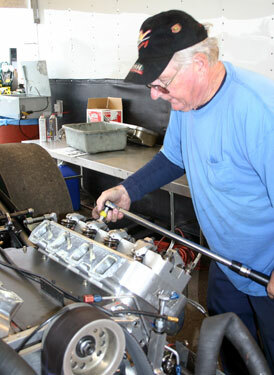 Jim may have gotten some useful information because a 6.058 at 250.00 was a great baseline run and the first "hemi" to make it from point A to point B without spinning the tires. 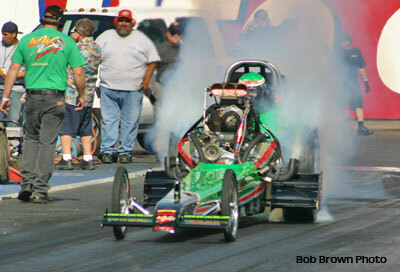 Cox was loaded for bear and started smoking the tires hard at about 30 feet. 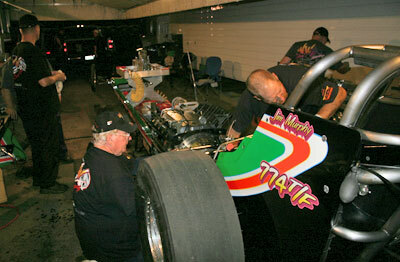 After the first session the crew went about taking the "top end" off the car for maintenance. 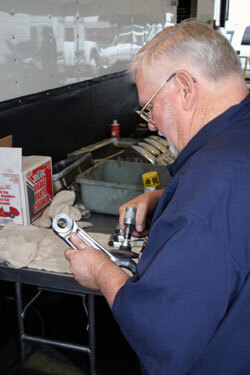 Crew Chief Tim Beebe removes the rocker arm assembly (above) and polishes the beam of a connecting rod (below). 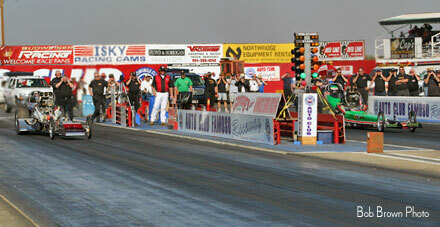 In the second qualifying session Friday evening Murphy was paired with Scott Mason from Utah. Murphy left like a rocket and Mason gave chase. Down track Mason got out of the groove and moved over into Murphy's lane but Jim was far ahead by then. 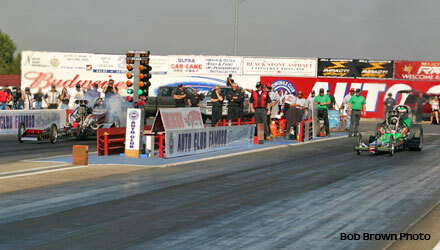 Murphy runs a flawless 5.877 at 254.59. 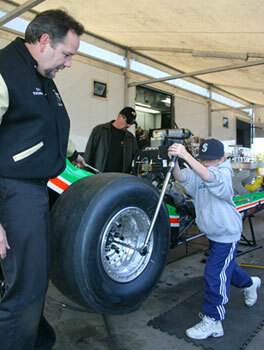 When it comes to drag racing, you're never to young to help. 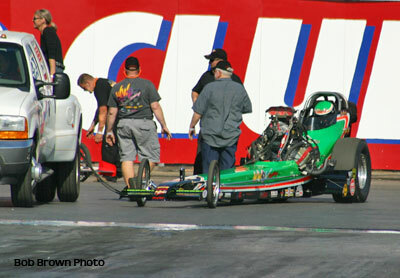 On Saturday Murphy was paired with Terry Cox for the third and last qualifying session. 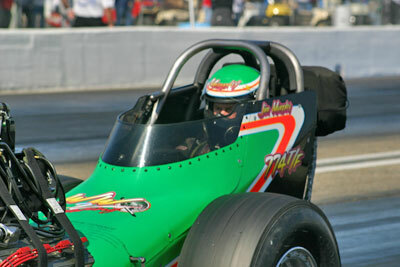 Both drivers were solidly in the show (Murphy # 2 - Cox # 3) so this was more or less a tune up lap. 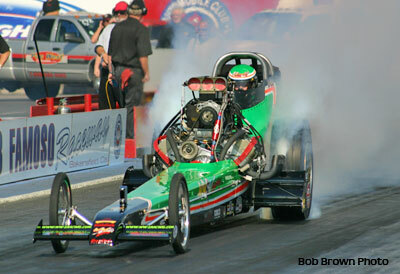 Murphy left really hard and the car was marching big time until about 1000 feet. 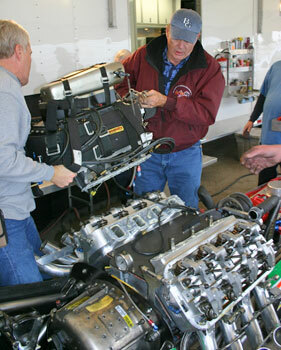 At that time the engine hit the rev limiter and the car nosed over as parts decided to part from the engine. 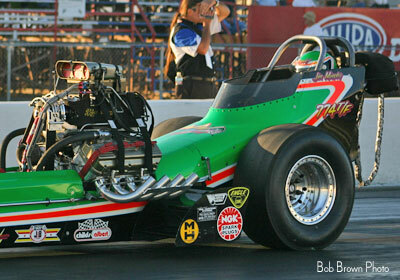 The good news was that Murphy took over the #1 spot with a 5.854 (low ET of the meet) at 237.84. 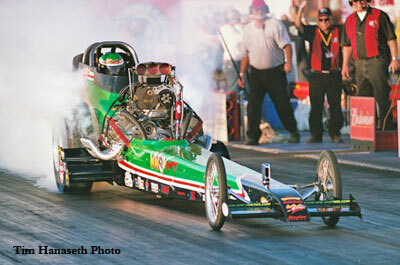 According to Murphy's data the car was on a high to mid 5.70 pass before he hit his head on the steering wheel. 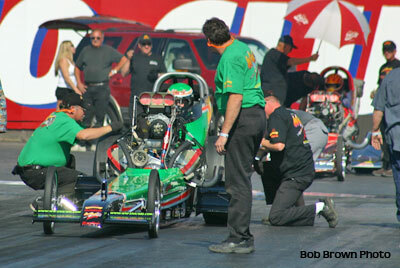 In the first round of eliminations Saturday evening Murphy was paired Bill Dunlap. Having a performance advantage Murphy cut a safe light and Dunlap took advantage. 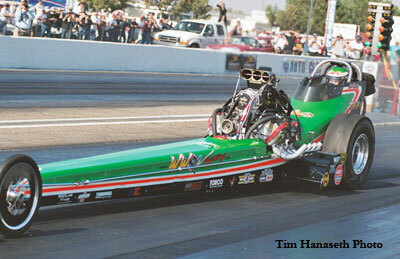 He got 4 hundredths on the tree and held off Murphy to take a 6.024 at 248.61 to 6.053 at 231.48 win. 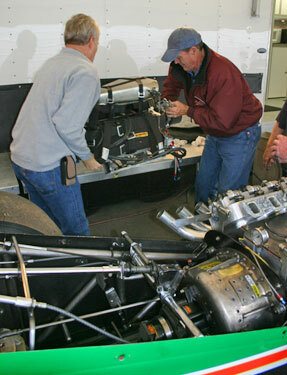 Bill Dunlap's sparkling MOV: 0.0810 seconds (approximately 27 feet). And that's a wrap for the 2005 season. 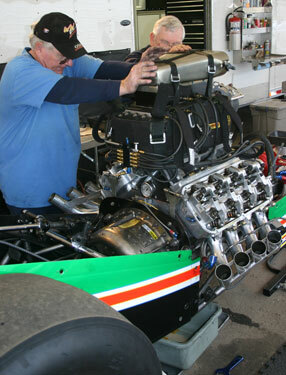 Next year the Jim Murphy and the WW2 Racing team will focus on one thing - winning the VRA Top Fuel Championship for an unprecedented fifth time. 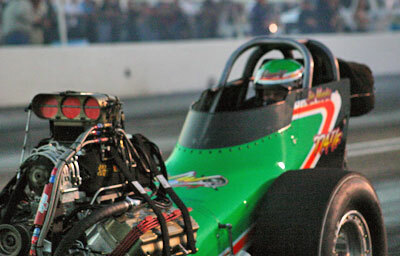 Murphy has no bones about saying he wants the Top Fuel Championship next season and will compete vigorously to win it again.